Willowbrook School is an Exeter based community school for children aged five to eleven, including provision for nursery children from the age of three. 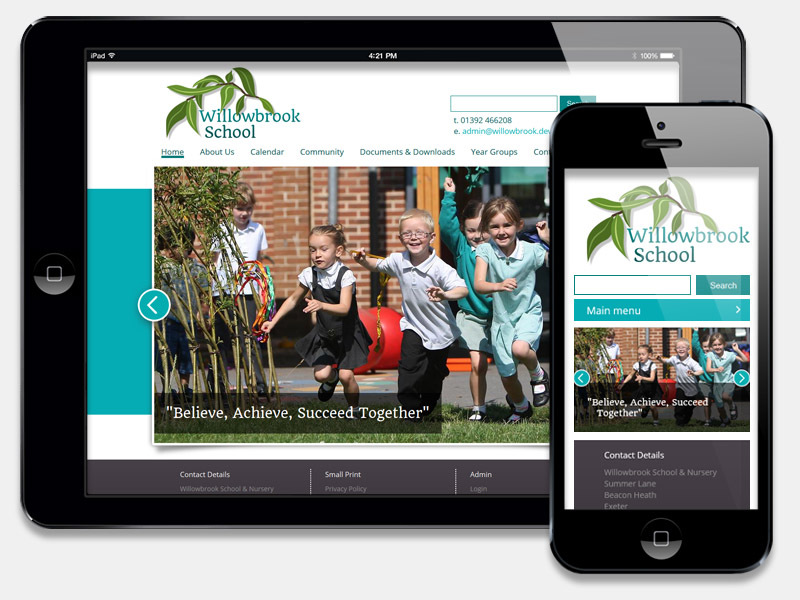 Willowbrook School required a new website. It had to be simple to use and maintain, but also meet the latest Ofsted requirements. We set to work creating a crisp. clean website with all of the features necessary to fulfil Willowbrook's Ofsted obligations. A major requirement for this project, was to guide the school and staff through the process of procuring a website and to advise on the best way to make use of modern CMS technology. This was backed by our usual high levels of customer service and website training, which enabled the client to immediately make use of their new website and to carry out their own updating before and after launch. Thank you so much for your excellent work on developing our new website, we are so pleased with it. Straight away at our initial meeting I felt that you were interested in how we wanted to portray ourselves as a school and used that as a guide as the development progressed. As I am not particularly skilled or knowledgeable in technology, it was important to me that someone could translate my ideas in a creative way and not confuse me with jargon! That is just what you did and you made the whole design process enjoyable. All I had to do was supply the information and you did everything else; checking at regular intervals as the website developed, giving me clear choices in plain language which was accessible. Now our new website is up and running and the onsite training for staff that you provided was excellent. They can maintain the website easily and keep it up to date. I can honestly say that I found the whole process a lot less stressful than I had anticipated and that was down to your honest expert advice and guidance, thank you.